At this time of the year, after the excesses of Christmas and New Year, the word detox is on many peoples minds. Detox what? The body has its own mechanisms for detoxification and adding a green juice or smoothie is not going to detox your body – it may provide the support to aid this cleansing process. What is important is the fact that we can support the body’s detoxification processes by cleansing and nurturing them. Last time around we looked at cleansing and supporting the lymphatic system and so I thought we would highlight two very important systems within the body that may require support – the gastrointestinal system and the liver. Our bodies are interacting with thousands of toxins and chemicals from: the air we breath, the chemicals we use in personal care products, cleaning agents we use, food, drink and water we ingest, the metabolism of food which produces end products that may damage our health – think sugar and its end products which are damaging to the body. It is estimated that the average person is carrying a minimum of 700 toxins within their digestive system, the liver, stored in the fatty tissues and so on. Toxins block healthy function of the body – the body is remarkably self regulatory – it tries to eliminate toxins on a daily basis but of course we are now exposed to more toxins than ever before and it needs support to prevent them from depositing these toxins, which can cause inflammation and damage and may eventually lead to a less than optimal function of the body. I thought that we would concentrate on the two big organs of detoxification namely the intestines and the liver since these are the primary glands that are exposed to toxins and if these are not eliminated from the organs then they may pass into the bloodstream and deposit onto other glands and tissues within the body. Of course there are other glands of detoxification such as the skin and kidneys. So where do you begin to cleanse the body? At the beginning! It has to be the intestines – if we don’t get it right in the intestinal tract then everything else will be compromised. So lets look at intestinal cleansing (including colon) and why this is important. Modern day diets tend to favour low fibre, nutrient poor, microwaveable, processed ingredients that we pass for food these days. Whilst this is fine the odd day a week, your intestines are simply not going to be able to cope with repeated exposure to such a diet and the result will be constipation, bloating and gas production. What happens is instead of absorbing nutrients and quickly passing waste material out of the body, which is what it was designed to do, this sort of diet tends to gradually accumulate and ferment. The result is slower bowel movement (should be twice a day as a general rule of thumb - most people don’t always achieve this!) and toxin build-up which then passes into the bloodstream to the surrounding organs. When food mixes with acids and enzymes, a plaque like compound results which can adhere to the walls of the intestines – referred to as mucoid plaque which may impede the absorption of nutrients. Unfortunately, most of us carry numerous parasites within our intestines. They feed on the food that is present in the intestines and excrete waste matter inside us. It is estimated that as many as 3000 different parasite species can invade the body. They are mostly single cell creatures but some may be longer. Raw or undercooked meat is the usual source of parasites and they are robbing the body of vital nutrients. Whatever the case, we should try and eliminate them from the body. The colon is the part of the large intestine which carries approximately 70% of dry faecal matter and this is where the beneficial bacteria perform their myriad of roles including nutrient absorption, controlling hunger, enhancing immunity, manufacturing energising B vitamins and even your mood is affected by an unhealthy colon. This is why it is recognised that colon cleansing is important! How do I know that I need to cleanse my colon? A variety of concerns stem from poor digestive health such as: stomach pain, abdominal cramps, chronic fatigue, constipation, low energy and food sensitivities. If you are not having one bowel motion on a daily basis then you are definitely a candidate for a colon cleansing. There are many types of colon cleansing methods and these include salt water flushing, colonics, enemas, laxatives (not a good idea) etc. Colonics are usually performed at a treatment centre and the gentlest ones use water fed by gravity to flush out waste from the colon. Enemas use smaller amounts of water and are usually performed at home which a lot of people prefer. Amazingly over 5000 colonics are carried out on a monthly basis in the UK and no serious side effects have been reported. But colon cleansing is not for everyone and I would not recommend this if: you are pregnant, suffer from haemorrhoids, if you have inflammatory bowel concerns – this procedure may be too harsh. 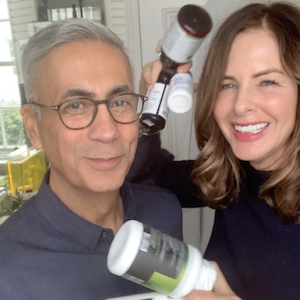 I think there is a better method that actually not only cleanses the colon but provides other benefits to the body – it is a supplement and it is called Complete Fiber Cleanse (£21). It is always a good idea to repopulate the gut after a colon cleanse because these bacteria may be removed during any cleansing process. 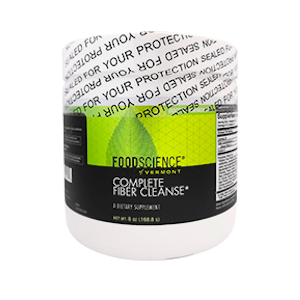 Complete Fiber Cleanse contains a blend of probiotic which does this. It also contains green foods to alkalise the gut and importantly also contains an amino acid called NAC which binds with heavy metals in the gut to aid their removal. A variety of health problems such as stomach pains, abdominal cramps, bloating, low energy, headaches and allergies may be associated with poor digestive function. Using a colon cleanser and conditioner should be of great value in helping digestive function and keeping the gut clean. I tend to recommend periodic cleansing of the gut with Complete Fiber Cleanse say two or three times a year. However, you can take this supplement on an ongoing basis – the recommendation of fibre intake on a daily basis is 30 grams and currently most of us achieve around 18 grams a day so a couple of teaspoons on a daily basis might not be a bad idea at all. However, fibre is not suitable for everyone. IBS sufferers who have constipation may adding to this problem since fibre will create a bulk. Also not all fibre as discussed earlier is the same. People with IBS found that soluble fibre intake helped their symptoms whereas insoluble fibres that remain intact and can cause irritation to an already irritable bowel. 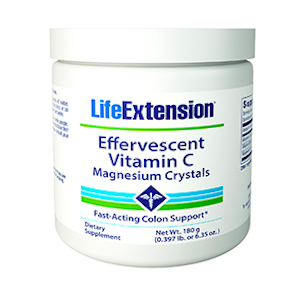 For people with inflammatory bowel concerns that require cleansing the gut, I would recommend Effervescent Vitamin C Magnesium Crystals (£19). After cleansing the intestines, cleansing of the liver would be a very good idea. Next to our skin, the liver is the largest organ and a very important one at that – often it is the last organ to be considered when it comes to health. Aside from its size, the liver is a very complicated organ involved in at least 300 functions – consider the liver to be involved in regulating, manufacturing, storing, processing and breaking down many different substances in the body. The liver works closely with the gallbladder which is kind of like a storage sac where bile is stored. When you eat food, nerve impulses in the small intestine cause the gall bladder to contract resulting in increased bile secretion which then flows into the small intestine to break down fats into smaller molecules so they can be taken up by the digestive system. The other role of bile is to act as a dump for chemicals and toxins that eventually need to be eliminated from the body. The quantity of bile produced by the liver is in proportion to the amount of toxins which can be eliminated in any given period so an unhealthy diet loaded with chemicals may result in the inability of the liver to produce sufficient bile especially because of the constant exposure to toxins that may age its ability to produce bile. This can result in toxins seeping into other tissues causing damage. Some of the liver’s functions include: cleansing blood and discharging waste products, neutralising toxins and poisons, managing chemicals and drugs in the blood, metabolising alcohol, manufacturing and destroying cholesterol, converting sugar to glycogen and storing it for release later for energy, helps digestion particularly of fats by the production of bile, removal of metabolic waste as a result of the foods we ingest and regeneration of itself. The liver is such an important organ that many practitioners believe that almost every disease could be associated with poor liver function. You can understand why it is important to keep your liver healthy and we would not survive for longer than between 24-48 hours without the liver. So what harms the liver? Too Much Protein – protein is hard to digest; in fact poor digestion of protein is a known factor in acid reflux which we have talked about previously. The liver has to metabolise protein and break it down into simpler components such as amino acids. The greater the consumption of protein, the greater the stress on the liver. This applies equally to both animal and plant protein but animal protein takes simply longer to break down and hence could cause more burden. Too Much Ammonia – ammonia results during protein metabolism and ammonia is very toxic – its accumulation could be fatal since it will damage the central nervous system. The liver converts ammonia into urea – this is the chief waste product in all mammals including ourselves. Too Many Simple Carbohydrates in our Diet – the body converts simple carbohydrates (if not used for energy) into triglycerides which are then stored in the liver as fat. The more simple carbohydrates, the greater the fats stored – the greater the fat stored, the harder it is for the liver to perform at its optimal level. Too Much Alcohol Consumption – alcohol is converted into acetaldehyde as it is metabolised which causes inflammation in the liver damaging the liver. The liver then has to process this toxin into water and carbon dioxide but in the meantime this acetaldehyde is causing the damage. As the liver gets damaged, it cannot filter effectively which causes it to get plugged up with fat from our diet leading to even worse filtration. Inflammation is the bane of the healing process within the body so in this inflamed state, the liver cannot regenerate itself. Toxins, Heavy Metals and Pollutants – we are constantly exposed to these from the air we breath to the foods we eat. The liver is constantly under a burden to convert these into inactive states in order to eliminate them. Lack of Exercise – this forces the liver to perform some of the work that should be carried out by the lungs and skin. Itchy Skin – when the liver is not functioning correctly, toxins may not be deactivated and some will filter back into the bloodstream. Spider Angiomas – these are the tiny spider-like capillaries visible under the skin and are associated with higher levels of oestrogen. Since the liver metabolises oestrogen, this may indicate less than optimal function of the liver. Bruising and Bleeding – if you find that you bruise or bleed easily, it may be another indicator that then liver is not producing sufficient amounts of protein needed to clot the blood. Blemishes and Hyperpigmentation – as mentioned earlier, when the liver is not functioning correctly, oestrogen levels increase. Oestrogen causes then excess production of tyrosinase, an enzyme that encourages excess melanin production which can then deposit as pigment spots. Fatigue – we don’t fully understand why but often other concerns coexist with poor liver function such as anaemia, hypothyroidism etc. 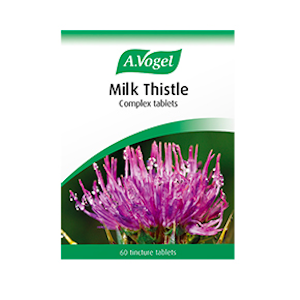 Milk Thistle – contains compound called silymarin which displays potent anti-inflammatory and antioxidant properties helping to protect the liver from the by-products all metabolism of fats, proteins etc. Firstly fat is metabolised effectively so less likely to gain weight; secondly by breaking down fats efficiently there is less likelihood of these depositing into the liver itself which would slow its function down. Bile is a dumping ground for toxins and increased bile means more capability of eliminating toxins from the body. Artichoke Leaf Extract – contains several active compounds including the well documented cynarin. It is the combination of these active compounds that work to enhance fat breakdown and to protect the liver cells against free radicals that it produces as a result of metabolism. Lipotropic Factors – basically choline, inositol, methionine and some B vitamins which are known to help remove and prevent fatty deposits from the liver which ensures better function and hence removal of toxins. Curcumin Extract – curcumin is the potent extract derived from turmeric. It is the most researched herbal extract in the world because of its multiple benefits including being cell protective, having powerful antioxidant properties, aiding digestion, cleansing the bloodstream, displaying antimicrobial properties, aiding circulation etc etc. Numerous studies indicate that curcumin may be highly effective for non alcoholic fatty liver disease improving. The dosage is two tablets daily; the supplement is free from gluten, wheat, soya, dairy etc. There is arguably no hotter topic in nutrition now than the health effects of sugar. Public Health England warned that the average child consumes 18 years worth of sugar by the time they are 10 years of age! Adults are no different and experts want the government to impose a sugar tax rather like they did to the soft drinks industry. How much sugar should we be consuming? Can you really detox sugar? How much sugar should be consuming? The increase in sugar intake can be linked to one thing – the industrial revolution! 1815 sugar consumption was an average of 130 grams a week – today women consume an average of 350 grams and men an average of 470 grams per week which equates to 11 teaspoons a day for women and 16 teaspoons a day for men. Children and adolescents are not that different which is frightening because this is very high for their proportional height and weight. The Scientific Committee on Nutrition in England recommends that 10% of your calories must be from sugar or less than 6 teaspoons a day for women, less than 9 teaspoons per day for men, between 3 and 5 teaspoons a day for children. We know that the by-products of sugar metabolism are toxic. They are called AGES and they destroy proteins within skin and the body’s glands. It is difficult to ascertain if sugar is toxic in itself because linking something in one’s diet to toxicity is not easy especially with so many hidden sugars – however there have been studies which have used sugar sweetened beverages (of which the general population seems to consume lots of!) and these have shown strong links to diseases such as heart health, type 2 diabetes and of course obesity. This is a hot topic in so far as neither tolerance nor withdrawal has been shown scientifically in humans. You cannot develop a physiological dependence on sugar like you can with a drug. Yes some people may binge eat foods containing sugar but that is an addictive behaviour rather than dependence. The word sugar detox is loose and what I believe we can all do is to mindfully reduce our sugar consumption and if we need support, which many of us do, due to hormone fluctuations or simply poor food choices, is to take a supplement that ensures that sugar is kept at even levels in the bloodstream using Viridian’s Chromium & Cinnamon Complex (£25) capsules – formerly called the 7 Day Detox. Chromium appears to make our insulin more efficient preventing spikes in insulin – too much insulin causes a reduction in blood glucose levels leading to cravings for sugar. 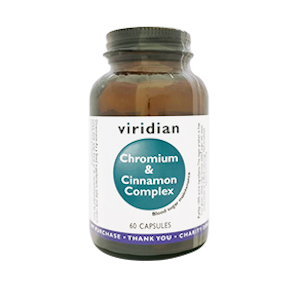 Cinnamon appears to directly control blood glucose levels preventing spikes. This supplement is not just for those seeking to control their sugar intake. It will also benefit women who have sugar cravings during their period. Over the last couple of years, veganism is truly on the increase. This term seems to be on a lot at the moment with people deciding to become vegan in January. I am unsure how many will keep it up but that’s another issue. What constitutes a vegan diet? Veganism rules out all animal derived produce including meat, dairy, fish, eggs and some would even rule out honey. 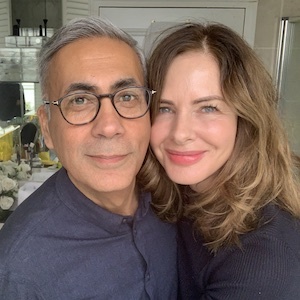 This may even be extended to include household and beauty products opting for brands that don’t contain animal derived ingredients nor tested on animals. Vegan diet is lower in saturated fats which tend to be linked to heart disease, diabetes etc. Vegans generally consume fewer calories so less likely to be obese. Farming animals and their by-products has a huge impact on greenhouse emissions – some 50% of these currently come from the farming industry. You have to up plant protein intake simply because plant proteins are not efficiently utilised by the body and this can create a problem with digestion and bloating. Some nutrients may be deficient with this diet and a lot of thought and effort has to be put into this type of a diet. Vitamin B12 – the biggest concern for vegans because this can only be found in animal based foods. 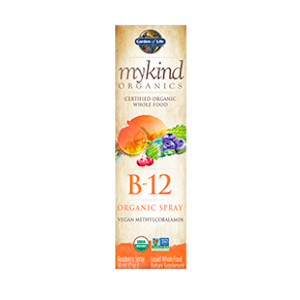 Vegetarian foods offer analogues that may actually block vitamin b12 uptake – you can get some in fortified foods but best to supplement this – there are a lot of b12 supplements but my favourite one is MyKind Organics B-12 Organic Spray (£12.99) – reasons is that it is sublingual absorption, organic flavours and fruits, no sweeteners etc. Iron - more common than you think actually because plant sources of iron – called non-heme iron are nowehere nearly utilised as animal sources so you need to eat a lot of greens to get the same amount of iron as you would a piece of meat. 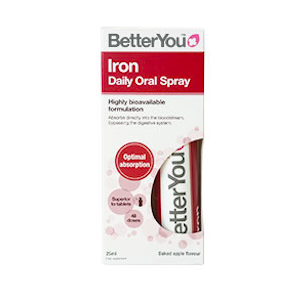 Better You Iron Daily Oral Spray (£9.95) provides non-constipating best absorption supplement. Omega 3 Fatty Acids - Most of us rely on oily fish to keep our heart and joints healthy. These contains EPA and DHA which curb inflammation and are required for countless processes within the body. Vegetarian sources of omega 3’s such as flax, hempseeds and rapeseeds simply do not contain EPA and their source of fatty acids need to be converted by the body into EPA and DHA which is not an efficient process at all. 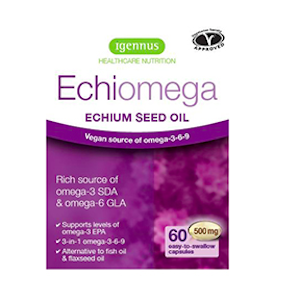 However there is an essential fatty acid suitable for vegans that is as efficient as fish oil derived from echium seed oil called Echiomega (£13.99). It is interesting to note that according to The Vegan Society 46% of Brits state that they would never become a vegan even if it improved their health or impacted on animal welfare.